Scientific Name(s): Kniphofia nelsonii Mast. From today until my vacation ends in mid-August, I’m abbreviating the commentary accompanying the photographs. This image was taken in UBC’s Alpine Garden. 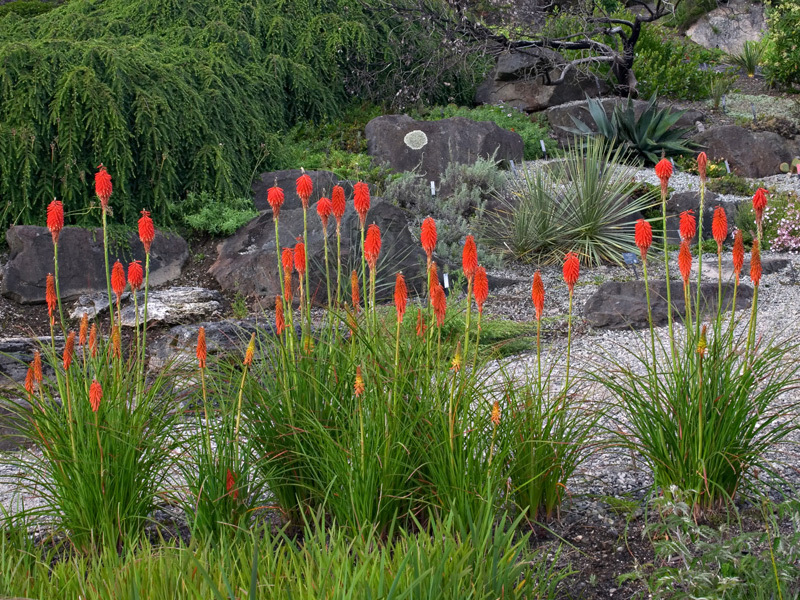 Commonly known as red-hot pokers or torch lilies, you can read more about this African genus of plants here: Kniphofia via the South African National Biodiversity Institute. Safe journey, Daniel. Not the same without you! Abbreviate away, and don’t feel one ounce of guilt about it! Have a wonderful vacation! Nice bit of lichen on the background rock… maybe a future subject? Via con dios and party on, dude. What does abbrev.commentary compare with what you will see and all the BPD joy that will come to all of us when you return! Lovely picture, full of vibrant color. Very pleasing to the eye. What a great photo! All muted shades of greens and greys . . . and then . . . SPLAT! SPLAT! SPLAT! . . . dozens of splashes of scarlet! It gives a kind of 3-D effect.